According to some runners, the Mizuno Wave Sky has the right amount of cushioning needed for long-distance running. Several runners admired the comfortable feel of the shoe. Some wearers noticed that the shoe required no break-in period. A good number of users admired the versatility of the Mizuno Wave Sky; they said that it’s also good for walking, gym training, and as a casual shoe. A couple of testers lauded the good-looking design and the available colorways. Most of the runners admired the responsive feel of the Wave Sky. Based on some user reviews, the shoe was able to provide a great amount of support. It runs true to size, based on some comments. The Mizuno Wave Sky is slightly expensive, based on a few reviews. The shoe has a narrow toe-box, said some users; it apparently didn’t give enough space for natural toe-spread. Most of those who tried the Mizuno Wave Sky admired the shoe’s high level of cushioning, as well as the plush and flexible ride. It has the right amount of underfoot protection for short and long-distance runs. This road shoe is packed with reliable technologies that deliver a good combination of comfort, stability, and performance. Do the Miles Fly By in the Mizuno Wave Sky? The Wave Sky has the appearance of a larger trainer, similar to the Brooks Glycerin 15. It weighs 11.1 ounces – although it feels lighter, has a 10 mm drop, and offers a medium volume fit for most. The Wave Sky is semi-curved and slip lasted. Some of the space inside the shoe is taken up by what I felt was an overly-thick, padded foam insole. When I removed this insole to replace it with a thinner sock liner, I discovered how well cushioned this shoe is. There’s a bed of compliant rubber that sits on top of the midsole. One can tell by pressing on this bed that the Wave Sky is going to offer some welcome bounce back on the road. The Wave Sky has some hard and durable X10 carbon runner on the heel and on the lateral side of the forefoot that adds a touch of firmness. But this does not mean that the shoe provides a firm ride, as I will touch on later below. The upper on the Wave Sky utilizes a number of different materials. It might come off as busy on a lighter colored shoe but looked just fine in the peacoat blue/silver/yellow colorway of my sample pair. I may not be the only person who sees some retro 80s/90s touches in the appearance of the Wave Sky’s upper. I like it. I also like the generous padding that surrounds the heel cup. It comfortably locks the heel in place for runs. Walking in the Wave Sky on the way to a running course, I could feel the responsiveness underfoot. And one gets the sense of stability that the shoe offers due to its wide base and flared sole. When first running in the shoe, it becomes clear that one does not need to choose between soft cushioning and good responsiveness; both are present. Often in a bigger, heavier trainer forefoot flexibility is sacrificed. But the Wave Sky has two full flex grooves and a third smaller groove up front. The Wave Sky is flexible and there’s an easy test that demonstrates this. Put the Wave Sky on and raise your big toes. The front of the shoe bends up with the large toes, which is exactly what’s needed. The Wave Sky feels close to the ground while running, despite its built-up appearance. As seen in the grades below, it’s a shoe that accommodates the needs of runners across a broad spectrum. You could not ask for more cushioning in a trainer. Well, you could but it would likely slow you down. The Wave Sky is quite responsive. The shoe provides a noticeable amount of impact displacement – all the bounce a reasonable person might ask for, while facilitating all styles of running. Speaking of which, the Wave Sky facilitates rapid feet turnover, so it can be used for the occasional speed session. I generally experience some sort of issue with my feet while running in a new model shoe. That was not the case here. While the Wave Sky protects the feet from being punished on asphalt or concrete, it has enough space and flexibility in the forefoot for toes to splay as they may. There’s enough support in the Wave Sky to enhance straight-ahead running, but not so much as to interfere with a runner’s normal foot strike. I still notice periodic references to Mizuno running shoes being firm. Well, keep in mind that I previously ran in the Mizuno Wave Sayonara, the Wave Sayonara 3, the Precision 3 and the Wave Rider 3. Those were firm shoes. I don’t feel the same level of firmness in the Wave Sky; in fact, it’s not even close. The issue may pop up on long training runs – say 13 to 15 miles or more. But at that distance, a number of trainers – including the Asics Gel-DS Trainer and the GT 2000 series shoes - will begin to feel firm. It may literally go with the territory. The Wave Sky retails for $150. The exemplary Mizuno Wave Shadow retails for just $110. So for $260 one may own a pair of trainers that will be sufficient for months of training. The Wave Sky can be used as a daily trainer, as a shoe for short to mid-distance training runs, and as a perfect recovery shoe when feet or knees are bruised or aching. The Wave Shadow is a good shoe for fast training days, race days, and long distance runs. The two shoes happen to represent two different styles, from appearance to function. The Wave Sky is a traditional somewhat heavy trainer that’s quiet and not too noticeable. It’s a stealth shoe that gets the job done. The Wave Shadow is a bright, light attention-getting trainer that’s always ready to run on race day. If you’re looking for a trainer that provides a roomy fit, excellent protection from hard surfaces, and enough responsiveness to enhance all manner of training runs, the Wave Sky is a shoe to consider. I found the Brooks Glycerin 15 to be an excellent trainer. I think the Mizuno Wave Sky is also excellent. It’s a great shoe for a new model trainer, and I expect that it will only get better in the future. People love their SUV’s. And why not? The SUV is the “Swiss army knife” of the car world. Who cares that it isn’t as sturdy or as powerful as a pick-up truck? Who cares that it isn’t as nimble, or as fast as a sports car. The beauty of the SUV is in its versatility. An SUV does a little bit of everything. A high-end SUV does a little bit of everything while keeping you nice and comfortable. Such is the new the Enigma running shoe. If you are one of the few that have run in the Enigma, feel free to enlighten me as to where the comparisons start and end. Otherwise, sit back, get comfortable, and let me tell you about all the reasons you’ll want to get this shoe (and a few reasons why you may want to reconsider). Truth be told, I’m having a hard time thinking of an adequate way of explaining how comfortable these shoes are. There is so much going on in the Wave Sky. It is not a simple shoe. Just when you think you understand everything about the shoe, you learn that there is so much more. So many different parts of the shoe lend themselves in unison to the comfort and performance of the final product. Concerning comfort, I formally must declare that this is one of the most comfortable pair of performance running shoes I’ve ever owned. The comfort of the Wave Sky rivals that of even my most accommodating trainers (Adidas Cloudfoam, Nike Flyknit). So, what makes this shoe so comfortable, compared to other premium running shoes? The answer to that question is Mizuno’s SmoothRide. And believe me, this ride is smooth. In all seriousness, I cannot stop raving about Mizuno’s SmoothRide and Cloudwave technology. So, what is Wave and what makes Cloudwave so special? Wave is the elastic plate that extends across the bottom of most Mizuno shoes. Different Mizuno shoes have different Wave configurations. In the Wave Sky, it extends across the midfoot and heel. This makes the whole shoe a bit lighter while keeping maximum comfort in mind. Personally, I can attest to this and would formally like to thank the Mizuno team on behalf of my feet and joints. The comfort of the Wave Sky is also a result of the U4icX midsole. The midsole provides a plush feel while also maintaining enough firmness to guide you to your next stride. The heel is also padded and serves to mitigate the effects of impact on hard surfaces. Furthermore, the upper is also designed with maximum comfort in mind. The sock liner, collar, and tongue are a pleasure to run in, eliminating any unwanted friction. While I wouldn’t recommend it, I’m sure it’s entirely possible to run barefoot in these shoes. Personally, the benefits of this comfort were apparent on my first run. The Wave Sky guided me to the next stride while eliminating most of the impact I would normally feel on my knees, my feet, and my back. Where this comfort was most appreciated, however, was at the end of my first week running in the shoes. I am very familiar with recovery after a week of running (icing my knees, bandaging my joints, putting pain ointments on my lower back etc.) However, this was entirely unnecessary after my first week of running in the Wave Sky. The impact reduction offered by this shoe is truly remarkable. The two curves in Mizuno Shoes. This effectively reduces the effects of impact, adding to the already comfortable ride and underfoot experience. This coupled with the U4icX foam underneath the foot, made for some of the most enjoyable, and pain-free runs I have experienced in recent memory. Continuing with my previously established car analogy, the pressure dispersion offered by the Wave Sky, compounded with the independent cushioning, acts like the shocks in a car. This effectively reduces the effects of impact, allowing for a super plush ride. Furthermore, the Wave Sky is also equipped with flex grooves in the heel, which also allows for force to be distributed equally on impact. If that wasn’t enough, the U4icX pods in the forefoot and heel also offer extra flexibility along with more independent cushioning. The flex grooves in the forefoot also allow for a smooth transition to toe off. As previously mentioned, the Cloudwave being 2 separate parts allows for added flexibility, also culminating in a softer smoother toe off and transition. This isn’t to say that the Wave Sky should be considered a “flexible” shoe. It is stiff and unwelcoming at first, especially when compared to minimalist shoes. More on that in the “cons” section. Personally, I enjoyed the added rigidity of the Wave Sky every now and again. The stiffness of the shoe adds to its responsiveness and helps ensure a faster toe-off. Honestly, I felt my strides to be more aggressive. I’m not sure if “aggressive” is the most appropriate word, but that’s how it felt to me. I always felt like my strides were purposeful and explosive. The beginning phases of wearing a new shoe are always the hardest. This shoe is no exception. In fact, I had a harder time breaking these shoes in than most of my other running shoes. However, I expected this to be the case, as this is probably the furthest thing away from a minimalist shoe. With added support, stability, and comfort come stiffness and difficulties in breaking the shoe in. However, after enough time and determination, the shoe became everything I wanted it to be. As I expected, after around 2 weeks of daily training, the shoe molded to the natural curvature of my foot, subsequently adding to the comfort offered by the shoe. Something that worried me about the initial stiffness of the shoe was the toe-box. I have no problem admitting that in the beginning, I had no faith in the room offered in the toe of the shoe. This, coupled with how stiff everything felt, lead me to believe that callouses were sure to follow long periods of running. As many of you know, nothing stops a run quicker than unwanted friction on a big toe, or pinky toe. I was pleasantly surprised by the toe room offered, which allows for even excessive amounts of toe-splay. I was never alienated from the road, and never once was concerned with turning my ankle during my faster runs. The shoe also manages not to restrict the natural movement of my foot. The U4icXStrobel lining aids in stabilizing my foot and subsequently boosts my performance. And performance, after all, is the most important thing for a runner. These additions contributed directly to my performance in a significant way. Most obviously, I could run longer! It’s as simple as that. Before training in the Brooks Ghost 10. In the Ghost, I could log roughly 8-10 miles a day without experiencing any of the negative effects of high impact running. I’m a big guy (6’3”, 180 pounds) so having the ability to run 9 miles a day, 6 days a week, was a big deal. I remember thinking to myself, I’ll never look for another distance running shoe ever again. Boy, was I wrong. The first day of training in the Mizuno Sky, I committed to myself to run for as long as the shoe would allow me. I took to running until I started feeling the effects of impact on my joints, feet, or back. These effects never materialized. No joke, I doubled my running duration on the first day of training in the Wave Sky (16 miles in 2 hours). For me, what is most impressive about the Wave Sky is that it offers shock dispersion, guidance, and energy return without compromising (much) on flexibility. I cannot speak highly enough of that. As a distance runner, the shoe delivers in every important way. I could summarize my review with the following sentence: while wearing the Wave Sky, I ran faster, for longer, and with less pain. In addition to that, the shoe is durable and has held up remarkably well considering the miles I have logged in it. Thanks to its X10 rubber bottom, the Wave Sky is also a very rugged shoe. The material is very durable. After running in the shoe daily for over three months, there are no signs of wear and tear. Furthermore, the tread has maintained its integrity. On most road terrain, the shoe performs admirably and grips the road effectively, even after 3 months of daily use. So, what does that daily use look like you may ask? Well, I’m a big guy, running mostly on pavement, logging between 50-60 miles a week. So, doing the math, that adds up to almost 700 miles traveled in this shoe. Not bad, right? Furthermore, the upper is surprisingly durable. The mesh and laces are still as intact today as they were when I first got the shoe. The construction is truly top-notch. This is a shoe that you will be pulling out of your closet for months, if not years, to come. Ok now, there is just no getting around the fact that this is a heavy shoe. At size 14, my shoe weighs in at over 12 oz. That is a big shoe. It’s clunky at first. In fact, during my first couple of runs, I couldn’t help feeling as though I was fighting gravity to lift my foot by the end of the run. This is compounded by potentially added weight from perspiration or rain setting in on the shoe. The mesh upper is absorbent. Any amount of liquid setting in on the shoe (sweat, rain) makes it feel very dense. Perhaps this is minor grievance for some, but as someone who runs for long periods of time, perspiration is common. As someone who runs outdoors, encountering the elements is also common. In terms of performance, it’s hard to think of a way in which the Wave Sky falls flat.However, as this is a review, I want to be as exhaustive as possible. The upper mesh of the shoe is amazingly durable. However, I feel as though this durability comes at the price of breathability.Numerous times while running, I felt my foot overheating. This lead to various complications, and discomfort. Depending on the duration of my run, and the temperature outdoors, the heat generated within the shoe was enough to make for uncomfortable sweating, and hot spots. On only one occasion, however, was I forced to stop my run and take the shoes off out of discomfort. As mentioned previously, I want to commend the Mizuno team for attempting to make the Wave Sky more flexible than other incarnations of high comfort, high stability running shoes. However, the Wave Sky is not a flexible shoe. I understand that it may be considered “flexible” in the realm of high comfort, high stability running shoes. However, when compared to other running shoes on the market, the Wave Sky is rigid. Personally, I am not too bothered by this. When running in shoes like the Wave Sky, you resign yourself to the notion that flexibility will be taking a back seat to stability and comfort. This is a shoe designed for longer runs, and the stiffness of the shoe never seems overwhelming. It gives you just enough flexibility to avoid feeling clunky. If you are in the market for a flexible, breathable running shoe, you should probably look elsewhere. It almost seems nit-picky to mention the flaws in such an inspired design. The Wave Sky is a shoe designed for performance. It is a shoe that was made for serious runners, looking to get the most out of their runs. For this reason, it is hard for me to say what I am about to say; I hate the look of this shoe. Some of the color options I find downright unattractive. While I understand the practical purpose of having brightly colored shoes (safety, visibility) I can’t help but be turned off by the available color schemes. The marine-inspired yellow, green, and blue combinations in my shoe were flatly unappealing to me. However, this is obviously a matter of personal taste. After all, one man’s trash is another man’s treasure. So, the shoe is expensive. There’s no other way to put it. At $150, I can tell you that I would gladly pay the price to own another pair, but not everyone will agree. When it comes to price points of shoes, I typically bring up the Adidas UltraBoost. In my humble opinion, the UltraBoost is a top of the line shoe, worth every cent of the $180 asking price. Personally, I find it hard to recommend any other shoe when that kind of money is on the line. If I had 150 dollars to spend, I would without a doubt scrounge for the extra 30 bucks and go for the Adidas. Some would be better served waiting for a sale before splurging on the Wave Sky. In my opinion, it is well worth the money, but would be an absolute steal, and subsequently impossible to pass up at a lower price point (100-130 dollars). So, you’re in the market for a top of the line vehicle. You want one that does a little bit of everything. You want reliability, you want power, you want handling, you want comfort. Well, my friend, you want an SUV. Not just any SUV though. You want a high-end SUV. It does everything you want it to do. It has a lot of moving parts, a lot of bells and whistles, and has your maximum comfort in mind. The aesthetic may be a bit obnoxious. It may feel a bit bulky and unresponsive until you get used to it. The price point may be a little high. Heck, for the money, you may even decide to splurge and get the luxury model. You’re effectively considering the Mizuno Wave Sky of the car world. Take it from me, you will not be disappointed with your purchase. 700 miles in, and I am still reaching for the Wave Sky almost exclusively. For one reason or another, I have fallen in love with this shoe. It is everything I want it to be from a performance standpoint. I have no doubt in my mind that I will be purchasing another pair soon, to replace the pair I currently own. I have a lot of respect for Mizuno as a company and have been thoroughly impressed with their product. So, if you are serious about your performance, serious about your comfort, or maybe by some miracle of fortune find the Wave Sky at a lower price, then you should buy it. Period. End of Story. Get this shoe, and thank me later. Because believe me, your feet will. 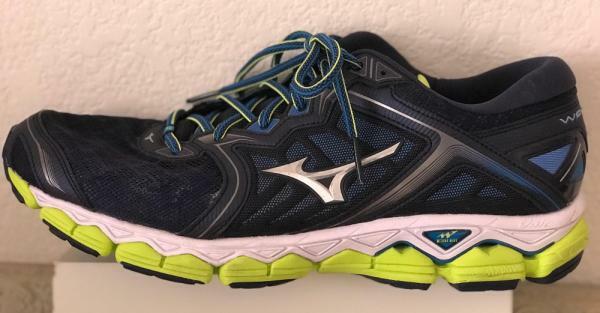 I chose the Mizuno Wave Sky out of a catalog, researched the specs and took into account my need for a long distance shoe, I wanted something for marathons and Ultras. Comfortable and functional was my criteria blueprint, the Mizuno Wave Sky resembled that constituent. The upper looks dated - stitched panels, mix and match of materials - more evident these days are seamless, no-sew, knitted uppers. With that same breath, I also admit that the shoe looks good in the traditional sense. Material and build quality holds a high standard and no compromises – I looked the shoes well over and found no obvious flaws. The outer sole is thick treaded and looks long lasting; a few runs will ascertain durability. Midsole has dual foam (light and spongy) that looks thick and plush. First run, the Achilles collar is well padded, your foot is locked firmly in place around the ankle. The stretch laces really help with footbridge comfort and lace tension. I usually struggle with new shoes to get my laces to the perfect tension, this was so easy. The Mizuno Wave Sky has a full cushioned platform from back to front; I can only describe it as a bouncy marshmallow. The Mizuno Wave Sky is a hard working running shoe. Heel strike is smooth – push off on the forefoot is well padded. Landing feels like a cascading softness that rolls through the length of your foot as the mid-sole pods and outer sole lugs make contact through the transition. Training runs and long runs are effortless with no hot spots or irritating rubbing. The upper at face value looks mundane, until closer inspection and you will notice that there are so many different materials combined to make this upper. There are different panels, underlays, overlays, supports, extra padding, stretch laces and reflective hill, there is also an additional length of “tape/ribbon” running under the big toe, I believe it to be there to prevent the toe from breaking through the upper. You can see and feel that a lot of work, thought and tech has gone into making this upper. On the other hand, I would like to see more integration of panels - more unity and simplicity, giving the shoe a more modern and lighter look. I would also appreciate a little more ventilation through to the toe box. The mid-sole consist of two layers of foam with a wave plate sandwiched in the middle. The wave plate and foam layers are at v-shaped arrangements from heel to toe. This V-shaped arrangement creates a cascading feel of cushioning through the landing. Cushioning is really good and at the same time push off is firm and not sluggish. The heel cavity, however, traps large stones, these cause a lot of discomforts when pushed into your heel soft tissue when caught unexpectedly in running motion. Plenty of rubber underfoot and surprisingly it does not make the shoe feel heavy. The rubber is firm but not clanky. I feel protected against irregular surfaces and confident that I might get a few extra miles out of the full sized lugs. Durability is good, the thick out-sole shows minimum wear after 265km. Grip even in wet weather (grass or asphalt) was adequately presented. Deluxe runner is what comes to mind when thinking about the Mizuno Wave Sky. It has an unusual cushioning that can best be described as a marshmallowy bounce. Quality materials, foam, and rubber have been utilized to manufacture a plush product. For a runner who does vast training runs or ultras, sky’s the limit as this shoe will get you there comfortably. My runs in the Mizuno Wave Sky consisting of distances between 10-32km, I felt less ground impact and reduced shock at my joints. It has been a fortunate opportunity for me to have experienced one of my best rides in the Mizuno Wave Sky; really a nice smooth enjoyable ride. In weartesting and in Runner's World Shoe Lab, we found that both the heel and the forefoot are very soft. Mizuno introduces the Wave Sky to replace the Mizuno Wave Enigma as the brand’s top-tier cushioned shoe. The shoe is packed with newer materials and enhanced technologies for a better running experience. The upper of the Mizuno Wave Sky features the new DynamotionFit technology. It is designed to deliver a seamless foot-environment and enhanced sock-like feel. It also provides a light and breathable upper coverage. The shoe also features the new Cloudwave technology. It is strategically placed in the platform to encompass the midfoot and the heel area for a well-cushioned ride and a smoother heel-to-toe transition. A full-length and improved U4icX foam is also placed in the midsole for a more durable and softer underfoot feel. It is also designed to offer a more responsive ride. Mizuno offers the shoe in the medium width for both the men and women’s version. The presence of the DynamotionFit technology in the upper enhances the overall fit of the shoe. It has a nice, comfortable fit for runners with a medium foot-shape. The Mizuno Wave Sky is available in standard running shoe length just like the Wave Sky 2. The Wave Sky uses the reliable X10 carbon rubber outsole material. It provides durability in high-wear areas and it also provides a good amount of traction while running on the road. The midsole of the Mizuno Wave Sky utilizes the new Cloudwave technology. It is an elastic, thermal plastic wave extended from the midfoot to the heel. This technology is engineered to deliver a well-cushioned ride. It provides added cushioning for heel impact and better guidance for a smoother heel-to-toe transition. Along with the Cloudwave technology is the full-length U4icX midsole. This improved iteration is lighter and more cushioned than the older version of the Mizuno U4ic foam. It provides a softer underfoot feel and a more responsive ride. On the upper of the Wave Sky is the Mizuno DynamotionFit technology. It is a 3-panel upper construction that is designed for a sock-like feel. It follows the natural movement of the foot while delivering a more secure fit. The shoe also has the U4icX Strobel lining. It is integrated into the upper for added comfort. The presence of the new and thicker anatomical sock liner provides added layer of underfoot cushioning for enhanced fit and comfort. Lastly, the Mizuno Wave Sky has a traditional lacing system that secures the foot comfortably. The padded heel collar and tongue also provide added comfort.